A double bowline is a type of knot. It is more secure loop than a regular bowline. Tying: First, learn to tie the bowline by laying the working end on the standing part and twisting to form a loop (the "hole" that the rabbit comes out of). Wrap the loop once more around the working end. Then pass the working end behind the standing part and back down through the double loop. 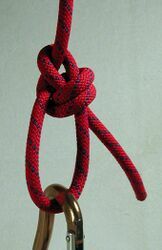 The double bowline is one of two typical tie-in knots used in climbing, along with the Figure-of-eight knot. The advantage of the double bowline over the figure 8 is it is easier to untie after being weighted in a fall. The double bowline is commonly used by sport climbers who take multiple lead falls and then have trouble untying their figure eights. The disadvantage of the double bowline is that it is more likely to come untied than a figure eight knot. This is especially true for newer ropes. For this reason, climbers should not tie in with a double bowline without also backing it up with a stopper knot. This page was last edited on 30 March 2007, at 22:20.